This is an older article, in the meanwhile, some new facts came to light to NASA and OMEGA. We did a new write-up, validated by OMEGA, on how the Speedmaster became the Moonwatch. Click here. 39 years ago, on July 21st 1969, 2:56 AM (GMT), Neil Armstrong became the first man to set foot on the moon. 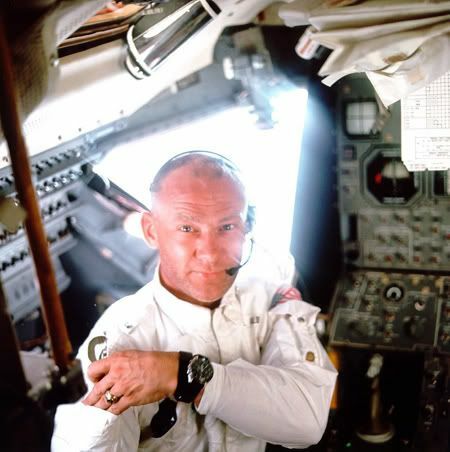 For us watch freaks, it is nice to know that not Neil Armstrong was the first to set a foot on the moon wearing an Omega Speedmaster Professional but Edwin ‘Buzz’ Aldrin was the first astronaut to wear the Omega Speedmaster Professional on the surface of the moon. 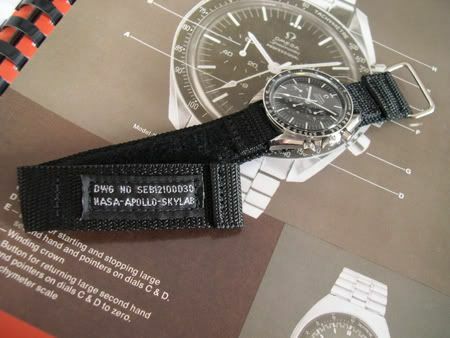 The technical debrief in 1969 states that the Neil Armstrong’s watch was left behind in the capsule since the mission timer was out (source: http://www.hq.nasa.gov/office/pao/History/alsj/a11/a11.evaprep.html). I assume it is also widely known that Buzz Aldrin’s watch got stolen afterwards, unfortunately. Late Chuck Maddox did a study on which type of Omega Speedmaster Professional was worn on the moon. And additionally, if it was really the only watch worn on the moon, as Omega claims it to be on their Omega Speedmaster Professional case backs. The full article written by Chuck Maddox can be found at http://www.chronomaddox.com/moonmovement.html. ‘ * mvt N xxxxxxxxxx * manual winding chronograph movement of Calibre 321 – 17 jewels * case reference: ST 145.012 – stainless steel * manufactured and delivered to our Agents in Danemark on October 25, 1968. I consider this one quite funny, since my own Speedmaster Pro pre-Moon ST145.012 was according to the same Mr Diethelm made in 1967 and delivered to Norway on October 22, 1968. Only a few days in between, and both to scandanavian countries. Were they the last to receive caliber 321 Speedmaster chronographs? As per november 1968, only calibre 861 Speedies left the Omega factory in Bienne. As for being the only watch worn on the moon, as Omega claims, this is proven to be wrong. David Scott wore a Waltham Chronograph on the surface of the moon during the third EVA of the Apollo 15 mission (source: http://www.hq.nasa.gov/alsj/a15/a15.eva2prep.html). The crystal of David’s Speedmaster Professional chronograph popped-off, and he started using his Waltham chronograph as a back-up wrist watch. David Scott’s training space suit on display in the Air and Space Museum, Washington, DC. On the earlier Omega Speedmaster case backs, the inscription was ‘The first watch worn on the moon’ which seems to be more spot-on than the current ‘The first and only watch worn on the moon’. Photo by Chuck Maddox, “First watch worn on the moon” caseback. Made between approx. 1969 and 1973. Anyhow, if you want to get closest to the real thing, I suggest you start looking for that caliber 321 Speedmaster Professional ref. ST145.012 and buy yourself a NASA Velcro strap from gasgasbones.com. These Speedmaster Professional pre-Moon models, as they are being called, are becoming more and more expensive. Thanks to the Omegamania auction held by Antiquorum in 2007. Prices are going up, also for the later 1970s models with calibre 861 movements. 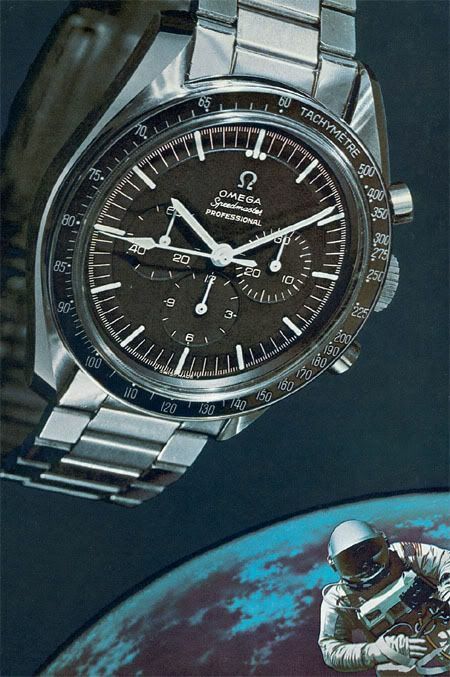 To wrap things up: I have been wearing my Speedmaster all day to commemorate the moonlanding in 1969. Wearing the watch also reminds me of Chuck Maddox, one of the guys that really got me into the obsession for Omega Speedmasters. I consider myself to be a lucky guy to have known this legendary chronograph collector. Click here for more titles.